Sunscreens protect your skin by absorbing and/or reflecting UVA and UVB rays. 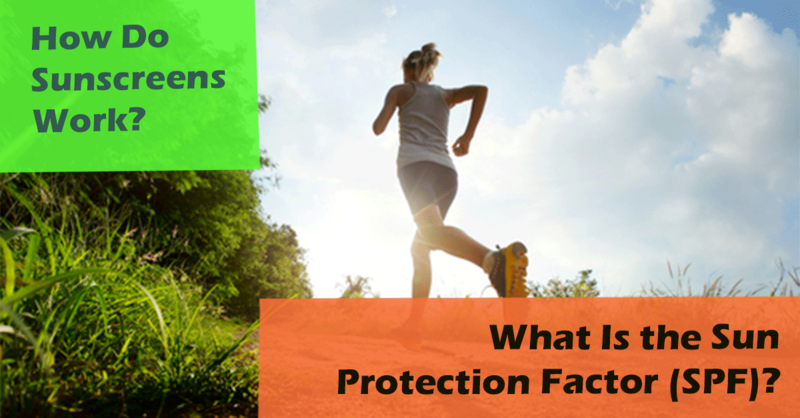 The FDA requires that all sunscreens contain a Sun Protection Factor (SPF) label. The SPF reveals the relative amount of sunburn protection that a sunscreen can provide an average user (tested on skin types 1, 2, and 3) when correctly used. Sunscreens with an SPF of at least 15 are recommended. 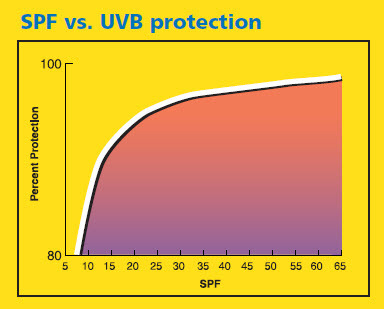 You should be aware that an SPF of 30 is not twice as protective as an SPF of 15; rather, when properly used, an SPF of 15 protects the skin from 93 percent of UVB radiation, and an SPF 30 sunscreen provides 97 percent protection (see chart to the right). Although the SPF ratings found on sunscreen packages apply mainly to UVB rays, many sunscreen manufacturers include ingredients that protect the skin from some UVA rays as well. These “broad-spectrum” sunscreens are highly recommended.